Just set up a workspace for JDeveloper 11.1.2.0.0 to show how to use a Groovy expression to set the primary key of an entity object. Chris Muir blogged about this back in 2009 here ADF BC: Using Groovy to fetch sequence numbers for EO/VO attribute default values. 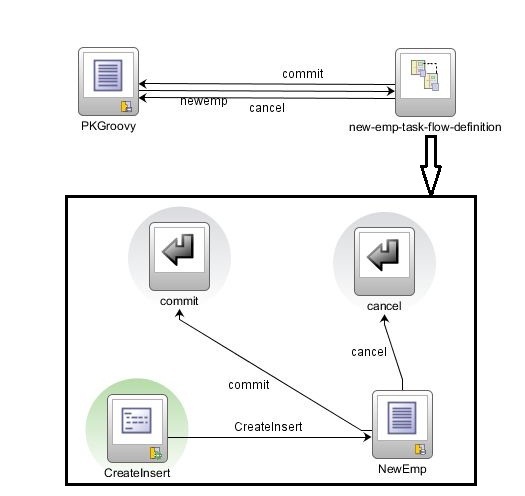 There exists a white paper Introduction to Groovy Support in JDeveloper and Oracle ADF 11g which covers Groovy support in JDeveloper. So, I don’t cover the basic here but only show how to use this in a sample application. 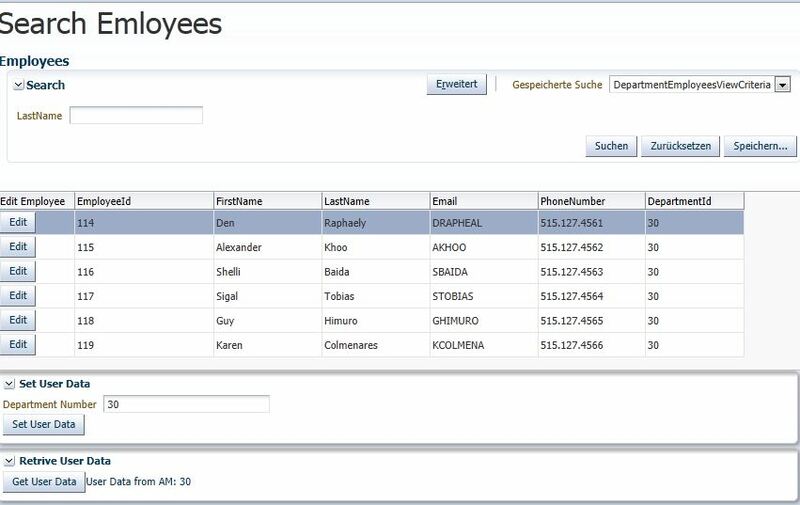 The application uses the HR schema and allows you to insert a new employee. The workspace which you can download (see at the end of this blog) is build using JDeveloper 11.1.2.0.0. 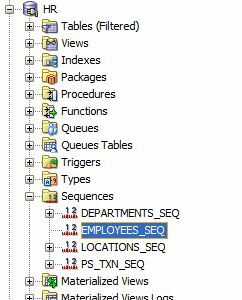 I use the EMPLOYEES_SEQ defined in the HR schema to set the PK of the new employee, EMPLOYEE_ID to the next available sequence number. 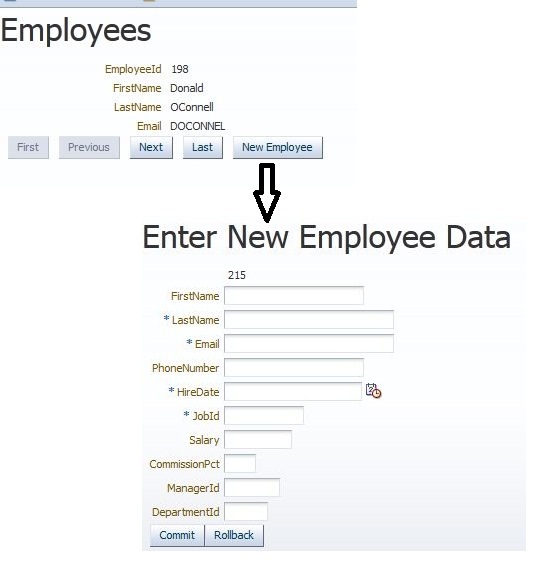 Now we can open the Employee EO from the model layer. 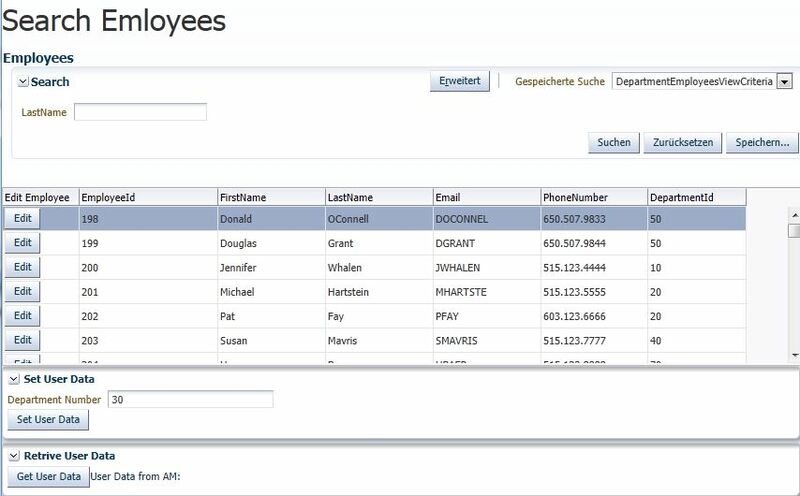 Double click on the Employees EO to open the properties inspector for the EO and select the ‘Attribute’ section. 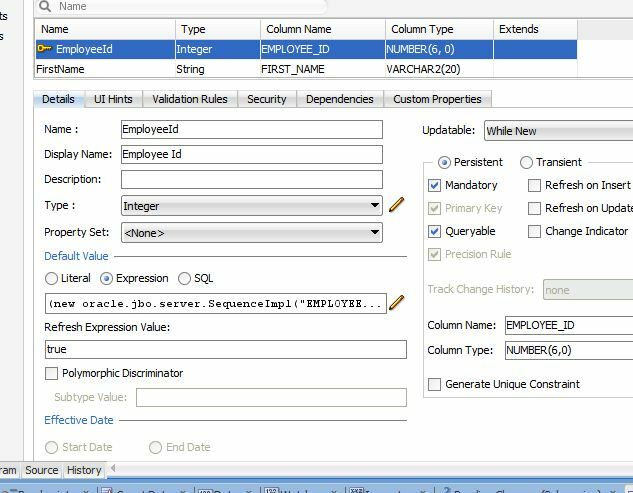 Now select the EmployeeId in the attributes to get to the attributes properties. Here we can add a default value as literal, expression or as SQL. We select the ‘Expression’ radio button and click on hte pencel on the right side of the input field. After submitting the dialog with OK you should set the ‘Refresh Expression Value’ to ‘true’ and the ‘Updatable’ LOV to ‘While New’. A word of caution here: JDev 11.1.2.0.0 saves the setting for the refresh condition in the xml file, but the next time you open the dialog again the ‘Refresh Expression Value’ value is gone! I’ll file a bug for this later. This wraps up the the model layer of the app. 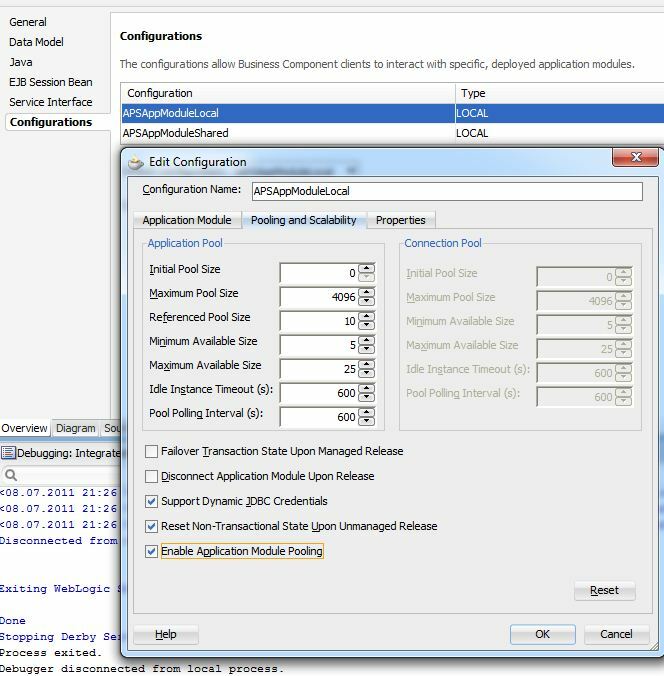 You can test your work with the Application Module Tester. When you create a new record you’ll see that the EmployeeId is set to the next sequence number. The ViewController project is pretty simple. 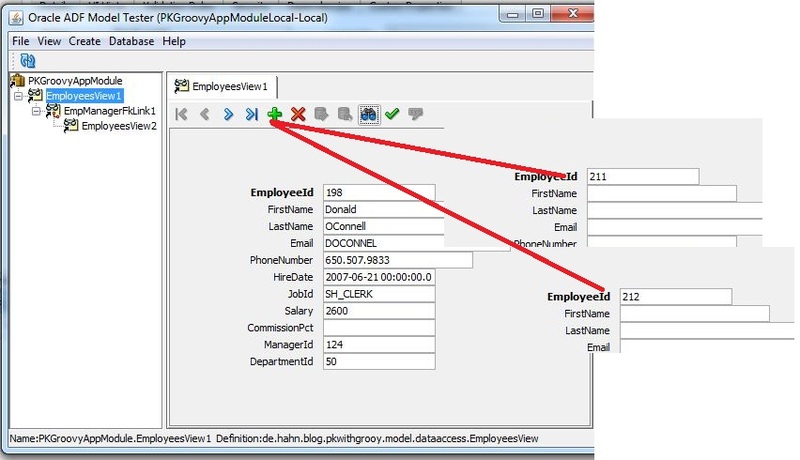 It consists of an ADF form with with navigation buttons and a button to call a bounded task flow to create the new employee. The bounded task flow first calls the CreateInsert operation to create a new record which is then displayed in the form. As you notice, the EmployeeId is an af:outputText element, so that you can’t change it. After downloading the file, remove the suffix ‘.doc’ and rename it to ‘ BlogPKwithGrooy.zip’, as the file is a Zip file.